Please note: This post was recently modified. It originally included an account that was found to be fake. The author would like to thank @YeniDiplomasi for its feedback and calling his attention to this fake account. During the recent outbreak of violence in Gaza, the IDF’s (Israeli Defense Forces) use of social media received widespread attention from international news outlets. This was due to the fact that both the IDF and the Hamas organization waged war on each other in both the physical and virtual world. 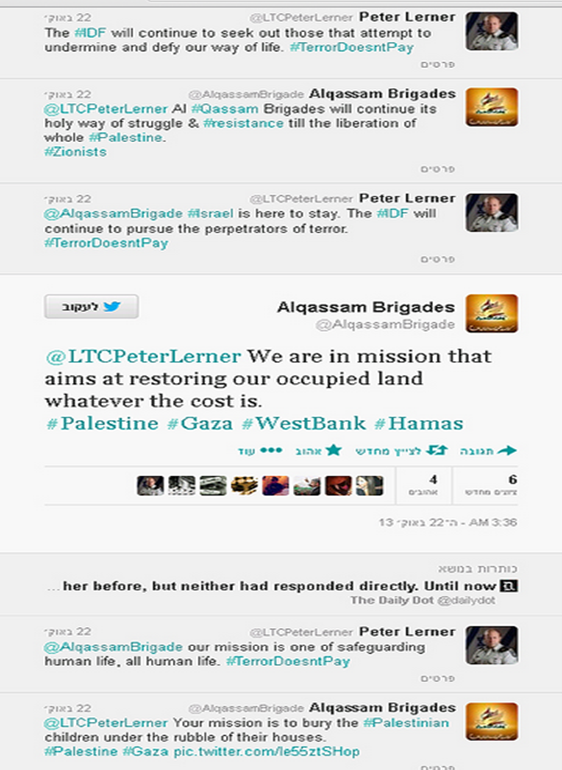 Such was the case when Peter Lerner, IDF Spokesman for International Media & Commander of the IDF Social Media Activities, openly confronted Hamas’s Alqassam Brigades via his twitter channel. It was Lerner’s use of twitter that led me to wonder if militaries now use twitter as a tool for gathering and disseminating information. But when reviewing Lerner’s twitter channel, I was surprised to learn that the IDF’s spokesman follows numerous diplomatic institutions. For example, Lerner follows the Palestinian Negotiations Affairs Department, UN organizations, Israeli embassies abroad, MFA spokespersons and foreign ministries (e.g., Russia, US, UK). Lerner also follows foreign ministers (e.g., Canada, Iran, US), foreign diplomats stationed in Israel and even twitter channels dedicated to the topic of digital diplomacy (e.g., @twiplomacy). The same is true for the Pentagon’s Press Secretary who follows US embassies abroad, US Ambassadors abroad and Ambassadors to the UN. Likewise, both Lerner and the Pentagon’s press secretary follow numerous foreign militaries on twitter. Do Ministries of Foreign Affairs (MFAs) follow militaries and military spokespersons on twitter? In other words, are military spokespersons now part of the national digital diplomacy apparatus? Do militaries follow one another on twitter in similarity to diplomatic institutions (e.g., embassies to the UN, MFAs)? In this post, I try to answer both questions. 1. Do Ministries of Foreign Affairs (MFAs) follow militaries and military spokespersons on twitter? In order to answer this question, I decided to compile a sample of twitter accounts operated by militaries. 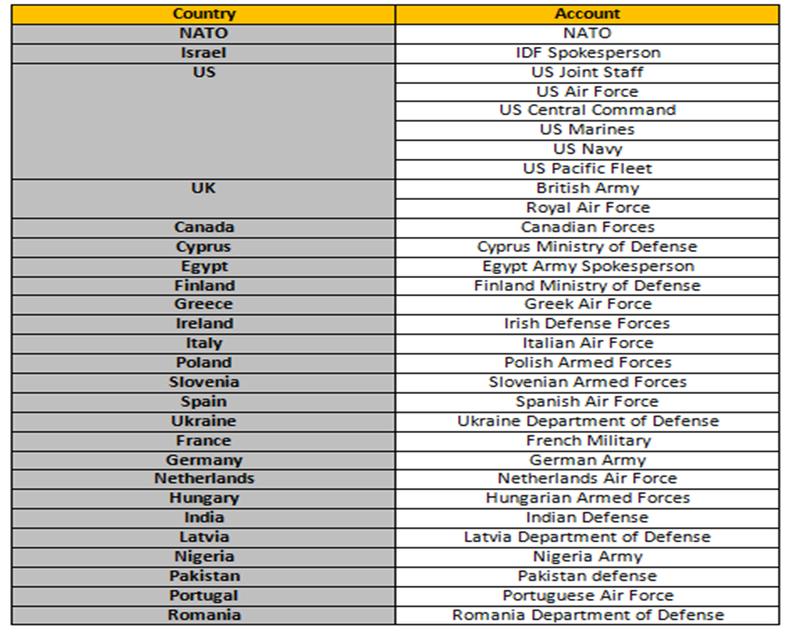 The sample, consisting of 33 accounts from various nations is shown in the table below. Next, I evaluated how many MFAs follow each military’s twitter account. The maximum number of followers could have been 92 as this is the number of MFAs I have identified on twitter. The graph below exhibits the number of MFAs following each military account. As can be seen, NATO is the only twitter account to attract attention from a substantial number of MFAs. This is not surprising as NATO is an alliance of some 28 countries. The second most popular military account amongst MFAs is that of Afghanistan’s Army which is followed by 6 MFAs. Other accounts, such as the IDF’s and those operated by the US Armyת seem to attract between 3-4 MFAs. Finally, the majority of accounts are followed by either 1 MFA, usually their own (i.e., Romanian MFA follows Romanian Army) or by no MFAs at all. It therefore seems that at the moment, the relationship between militaries and MFAs is one sided. While military spokespersons follow MFAs, the latter do not reciprocate. This could also indicate that military twitter channels are not an integral part of the national digital diplomacy apparatus. That said, it is important to remember that military twitter channels do attract large numbers of journalists who view such accounts as important sources of information. Thus, during times of conflict such accounts take part in creating the national narrative and answering the question-why we fight. 2. Do militaries follow one another on twitter in similarity to diplomatic institutions (e.g., embassies to the UN, MFAs)? 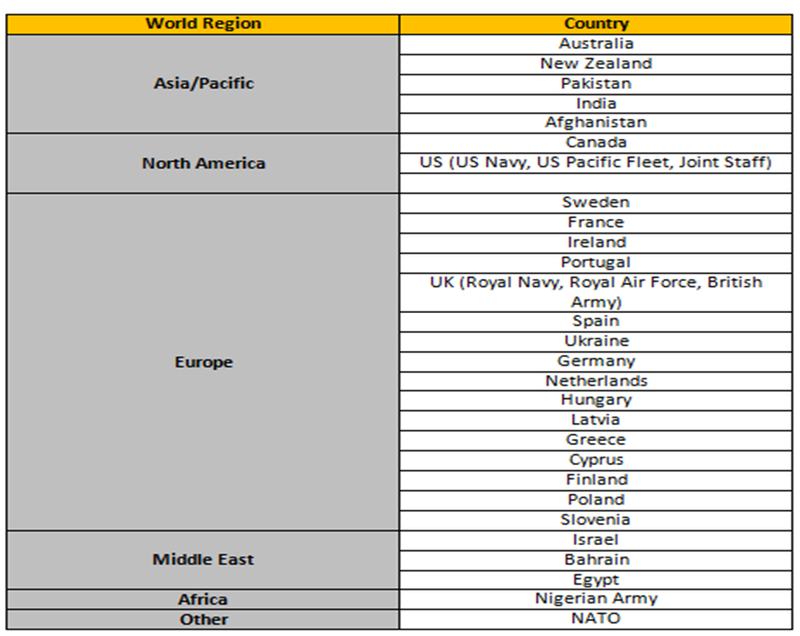 The Social Network of World Militaries can be seen in the image below. What characterizes this social network is a lack of central hub. 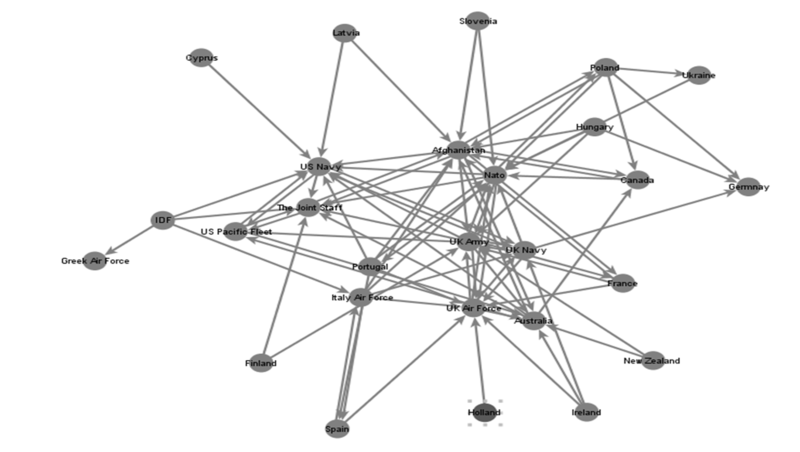 There is no densely inhabited gray area which represents the core of the network. This is due to the fact that very few militaries follow one another. On average, a military in the network is followed by 2.6 other militaries. This is a very small number. For comparison, the average MFA is followed by 14 other foreign ministries. In order to analyze the network, three parameters were calculated. The first is the in degree parameter which measures each military’s popularity within the network. The twitter account with highest in degree was the US Navy with Afghanistan’s army coming at second place than NATO, the UK Royal Air Force, the US Joint Staff, British Army, Australia, UK Royal Navy, US Pacific Fleet and Germany. The out degree parameter, which indicates the amount of other militaries with whom one military has contact, had similar results. The military with the highest out-degree score was the British Army with Afghanistan coming in at second than NATO, Italian Air Force, Poland, UK Royal Navy, Portugal, Australia, IDF and UK Royal Air Force. 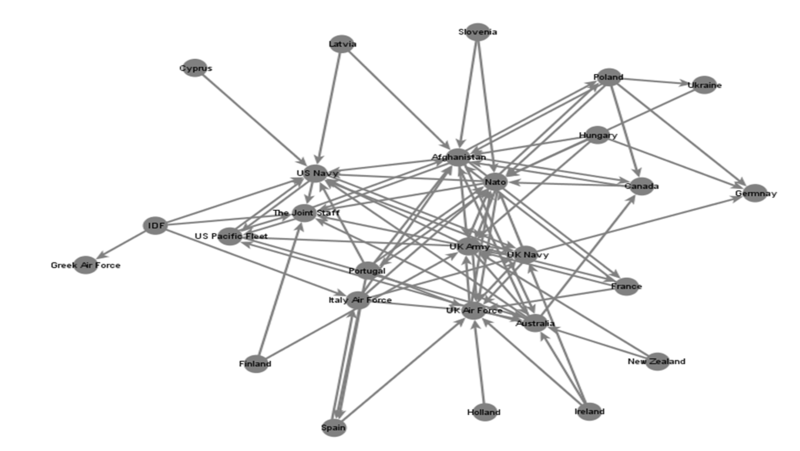 The final parameter measured was betweenness which reveals which militaries serve as important hubs of information as they link together militaries that do not follow each other directly. The military account with the highest score was NATO than Afghanistan, British Army, Portugal, UK Royal Navy, Poland, US Navy, UK Royal Air Force, Australia and Spain. It is important to note that the three UK military accounts seem to be the most popular, most active and most important hubs of information in this social network. Afghanistan also received high scores on all three parameters. However, this account is of joint Afghan and NATO forces operating in Afghanistan thus it is possible that its popularity derives from the NATO component.